The Vanguard BBH-200 Ball Head was introduced in 2012, but flew under my radar until friend-of-the-site Ross made me aware of it recently – more than a year after its introduction. Based on Ross' recommendation, I contacted Vanguard and was promptly supplied with an evaluation unit. Turns out that Ross gave me good advice and the Vanguard BBH-200 is one of the best ball heads I've used. While I use some large geared heads in the lab/studio, ball heads are the tripod head type I use nearly exclusively for the rest of my work. Most ball heads offer similar features including quick and easy setup and most have the flexibility needed to handle the common situations I encounter. However, not all ball heads are equal in their quality and performance. For my use, there are three criteria that quickly separate the ball head contenders. 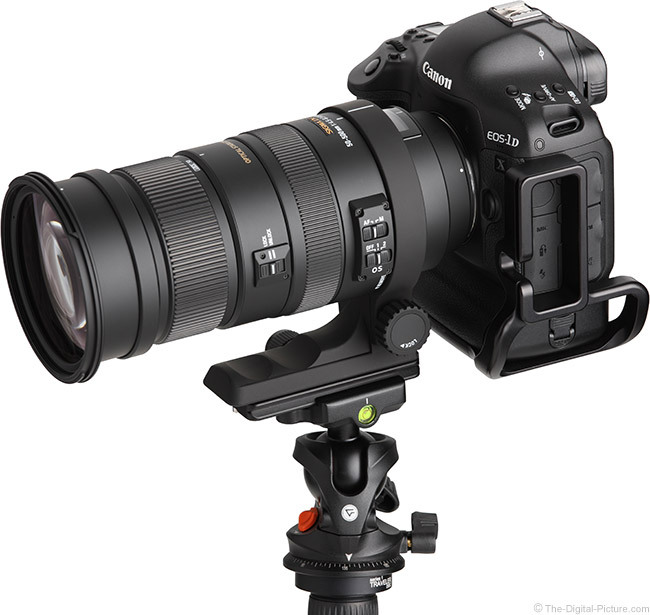 First, I need an Arca-standard clamping system for quick and solid attachment of cameras, lenses and other accessories. Second, the subject framing must not change when the main friction knob is tightened. And third, I need the ball movement to remain smooth (without slip-stick behavior) until it is fully tightened. I knew the BBH-200 featured Arca-Swiss quick release plate system compatibility before committing to this review, but I was delighted to find that the ball head meets my second and third criteria as well. This head works very well and looks great too. Via product images, let's take a closer look at this head. The skeletal/open-body design is both pleasing to the eye and weight-saving. The scratch-free oxidization-anodized surface of the ball rotates very smoothly from loose until locked fully tight. The ball rides on an attractive orange high tech plastic surface under the magnesium frame of the head. One differentiator for this head is the use of a large lever for the main ball friction lock. You can't roll a lever in your fingers, but the lever can allow for greater torque in tightening the ball. This leverage is appreciated when mounting a large, heavy lens on this head. Tightening the main friction knob pulls a hinged magnesium frame tight into magnesium base, locking the ball into place. Critically important to me (as I already mentioned) is that the ball remains smooth with no slip-stick action until fully into place and subject framing does not change as this is happening. I tested this head in temperatures as low as 18° F (-8° C) and this head continues to perform very smoothly. Pulling out on the spring-loaded strong plastic lever allows repositioning of the lever relative to the bolt it is turning inside. I like my locked lever angle to be straight down as that is where I feel I can get the greatest leverage with my left thumb. The main locking knob is not captive, but it is unlikely that you would unintentionally rotate the lever the three full turns that is required to remove it from the head. The lever locking knob accepts enough pressure to lock very tightly. Tight enough that the Vanguard BBH-200 Ball Head will hold the Canon EF 600 f/4 L II IS USM Lens at a downward angle even with some light pressure on it. I would probably opt for the BBH-300 for using a lens this large with any regularity, but the BBH-200 worked fine with this big lens. Review Update: Apparently, the large lever lock allows too much torque to be applied. With my bad habit of applying too much torque, I managed to tear the threads out of the head. This ball head does not lock tightly as easily as some of the other heads I've used, but I was definitely over-tightening the lock when working with the large lenses. No worries as Vanguard very quickly repaired (replaced?) the head. No minimum friction set is provided – you control that friction amount yourself using the main friction lever. You quickly learn what position the locking knob needs to be in to get the friction level desired. A second lever at the bottom of the head functions as the panning lock. With the amount of leverage available from the relatively large knob, the panning base locks very tightly. Loosened, the base pans with excellent smoothness. A laser-etched scale in the base allows precision angle changes, ideal for panorama photography. 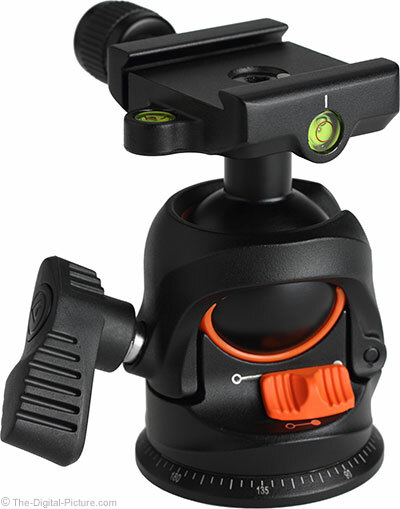 Also ideal for panorama photography and for videography is Vanguard's unique Rapid Level System implemented by the big orange switch. When the main friction lever is loosened, this switch can be slid to the right. At this point, the clamp and ball can be moved until the ball locks into a level-with-base position. There is a small amount of play in the guide, but this makes finding the level position easy. With the bubble level on the side of the quick release clamp, the absolute level position can be found within the limits of the locked-level position. Once into the level position, the main friction knob can be tightened to prevent the clamp from coming out of the level position (though it takes some pressure to do this even without a tight main knob). This is a useful feature, but it of course requires a level tripod to get a truly level camera. On top of the ball stem is a single-line-indexed Arca-standard quick release compatible clamp. The standard-threaded clamp locking knob is captive and has a bubble level opposite of the knob. A second bubble level is attached to the side of the clamp. The clamp appears to be removable via a metric hex key wrench, but I did not apply enough force to prove this. Included with the BBH-200 and shown below is the Vanguard QS-60 Quick Release Plate. The small, un-marked QS-60 universal plate retails for $29.99 alone and it is a very useful addition to the head. While this plate is Arca-compatible, it is not compatible with RRS Lever Lock clamps (the plate remains loose in these clamps). The plate works fine in the Wimberley & Arca-Swiss threaded-style clamps I tried. Not as standard is that the QS-60 plate has a recessed bottom that allows a spring-loaded retaining pin on the BBH-200's clamp to prevent the plate (and camera attached to it) from sliding out. The Wimberley, RRS and Oben camera and lens plates I have work fine in the BBH-200, but the security pin is not universally supported by all and the pin can impede lateral adjustment in some combinations. Overall, and especially for the price, the Vanguard BBH-200 Ball Head is a head I would have no problem using daily. This Arca-Swiss-compatible ball head has great looks coupled with great functionality including a very smooth and strong ball and locking mechanism. I rate it among the best heads I've used.